For the 2011 graduating class, commencement is beginning to appear on the horizon. With just a quarter and a half to go, it is almost time to start preparing for the big event. Amidst all of the anticipation surrounding this milestone, here’s some news that will make you even more excited about graduating: participating in this year’s commencement will help save the planet. That’s right – all caps and gowns worn by this year’s graduating class will be made from 100% post-consumer recycled bottles. An average of twenty-three plastic bottles will go into the making of each cap and gown. 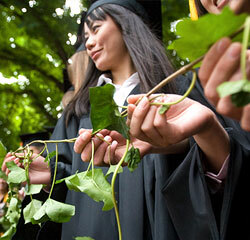 Categories: Campus Events | Tags: Commencement, Ivy Cutting, plastic, recycle, upcycling | Permalink. King delivers his famous “I Have a Dream” speech on the steps of the Lincoln Memorial on August 28, 1963. On Monday, our nation celebrated the life and legacy of Dr. Martin Luther King, Jr. King’s life demonstrated that peace and tolerance can triumph over hate and injustice, and can serve to correct social wrongs. On this holiday, we are reminded of his heroic devotion to equality, justice, and unity. In the spirit of Dr. King, it seems appropriate to talk about an issue that has stemmed from King’s movement. The term “environmental justice” did not become popular until the 1980s, but the movement’s roots stem from King’s legacy. Categories: Campus Events, Community Involvement, Environmental Justice | Tags: environment, Equity, John Perkins Center | Permalink.